Flexible screw conveyors in popular sizes are now available for shipment in two-to-five days as ready-to-assemble packages with Flexicon’s Quick-Ship Programme, the company announced. Conveyor tubes and screws offered through the programme are supplied in any length from 3 to 12 m, in diameters from 67 to 115 mm OD. 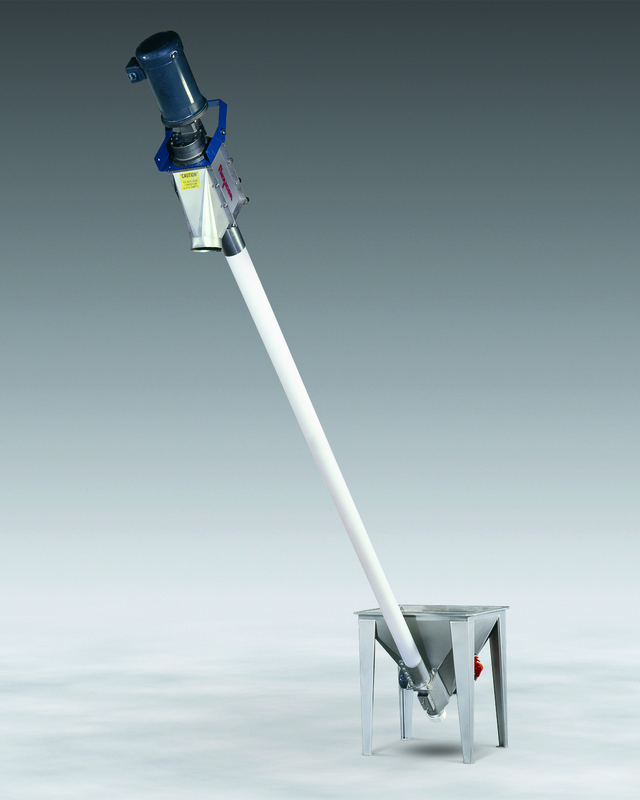 Also included as standard are a stainless steel floor hopper, 45 or 90 degree discharge adapter, TEFC or wash-down duty motor, and water-resistant control panel. All product contact surfaces are of stainless steel with the exception of the polymer conveyor tube. Non-product contact surfaces are of carbon steel construction with durable industrial finish. Stainless steel screws are supplied in a range of geometries matched to the material being conveyed. Options include a hopper flow promotion device, hopper cover with unflanged inlet port, hopper screen and low-level sensor. The conveyors can transport a broad range of bulk materials from large pellets to sub-micron powders, including friable products, abrasives and materials prone to pack, cake, bind or smear, with no separation of blends. Depending on screw geometry selected, material can be conveyed at any angle from horizontal to vertical, in a straight or curved path, through small holes in walls or ceilings. The screw is driven beyond the point at which material exits the discharge housing, preventing material contact with seals and related issues of bearing failure and product contamination. The inner screw can be removed through a lower end cap for wash down and inspection, and the conveyor tube flushed with water, steam or cleaning solution. The company also manufacture flexible screw conveyors in diameters from 67 to 203 mm on a custom basis, as well as tubular cable conveyors, pneumatic conveying systems, bulk bag dischargers, bulk bag conditioners, bulk bag fillers, drum/box/container tippers, manual dumping stations, weigh batching and blending systems, and engineered plant-wide bulk handling systems with automated controls.